"I'd rather wake up in the middle of nowhere than anywhere else on Earth." The Sierra Nevada in California can be thought of as great flat slab of granite, tilted so that it rises slowly from west to east, ending in a very abrupt and steep eastern escarpment. The western-facing aspect is dissected by a number of magnificent, glacier-carved river canyons, most notably Yosemite. 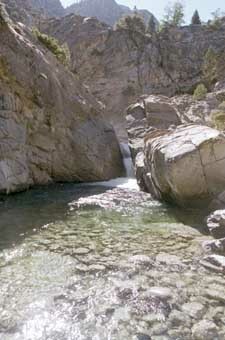 Hardly less significant are the canyons of the Middle and South Forks of the Kings River somewhat to the south. The South Fork's canyon is easily reached by a good if winding road down from the northern entrance to Sequoia National Park at Grant Grove. The drive down into the canyon to Cedar Grove is one of the least-known but most awesome thirty-mile stretches of road in California, a state that does not lack for such things. Then there is the Middle Fork Canyon. There is no easy way to it. 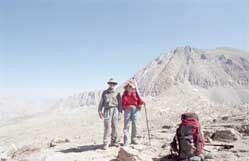 It is in the heart of the Kings Canyon National Park wilderness, hence access, except in emergency and rescue situations, is paid for with sweat. It is hard to say which access is least unattractive. From the west, a twenty-mile walk from a trailhead at Courtright Reservoir takes you to the rim of the Tehipite valley, a Yosemite-like wide place in the lower Middle Fork Canyon three thousand feet below. Alternatively, from the east, the far side of the Sierra, one can go over twelve thousand-foot Bishop Pass seventeen miles to the upper end of the canyon. From Cedar Grove on the South Fork there are two ways. One way is up the South Fork to Woods Creek to the Muir Trail, over Pinchot and Mather Passes, both twelve thousand feet to the upper end of the canyon, the same point as the Bishop Pass route. It amounts to about forty miles. Finally, one can ascend from Cedar Grove at five thousand feet over Monarch Divide at 10,600 feet and down to the Middle Fork at Simpson Meadow at six thousand feet, a distance of twenty miles. Other approaches can be dismissed as only for the young, strong, and truly insane. I used to be that. Fly fishing is a relatively recently taken-up obsession for me. Memories of a couple of long-ago visits to the Middle Fork had me wondering what it would be like to fish there in arguably one of the most "nowhere" places in California, to say nothing of the fine wild waters on the way. There is really good mapping software available these days, http://www.topo.com, which I used all last winter to plot and scheme how I might do it. What evolved was to go out of Cedar Grove over the Monarch Divide to Simpson Meadow, up to the upper end of the canyon and back via the Muir trail over Mather and Pinchot Passes, Woods Creek, and the South Fork. This amounted to a trail distance of seventy miles and a gain and loss of sixteen thousand feet total. The party was myself and my wife, Pat. We planned a ten-day trip. While the trail distance is not that much for ten days, the altitude gain and loss was formidable, especially since the worst of it would have to be attacked head-on with the heaviest load. Since we are both pushing and/or have reached age sixty, we decided to pull that punch by having a horse-packer take us up the first five thousand feet to the shoulder of the Monarch Divide. We started on August 1. At the trailhead we met the packer who produced a horse each for us to ride, a somewhat ornery mule to carry our backpacks, and a wrangleretteundefinednamely his twenty-something daughter who was quite good at it. She didn't take any crap at all from the mule and didn't have to resort to the 2x4 solution. With her help, the ride up was uneventful, producing progressively better views of the South Fork Canyon. The four hours that it took was about the limit that our non-equestrian butts could take. The good news was that we were now at 10,300 feet with minimal physical effort, doing in four hours what would have taken the better part of two days. The bad news was that we were now at 10,300 feet and not acclimated to the altitude. From that point to the rim of the Middle Fork Canyon was about eight miles across Granite Basin and the Monarch Divide, with ups and downs of about two thousand feet. We accomplished about half of that this day before flaming out with exhaustion. There are good fishing lakes up on the Monarch Divide, but I was too far gone the think about them that night. This brings up the essence of the game one is playing on a trip like thisundefinedhow much time can I spend fishing, photographing, enjoying a spot while still covering enough ground and having enough food to complete it? The next morning, somewhat refreshed, we started out anew, but it soon became clear that Hofstadter's Law (It always takes longer and is harder that you think even when you take account of Hofstadter's Law.) rigorously applied to our efforts. It was early afternoon before we got to the rim of the Middle Fork Canyon. From there to the bottom is a sunny and hot, waterless trail dropping four thousand feet in five miles to the floor of the canyon. This was the point of commitment. From the canyon floor, it would be either back up this daunting trail or fifty miles over two twelve thousand-foot passes to get back. We did it. Pat rated it a thousand-milligram ibuprofen trail. We arrived at the bottom, dusty, thirsty, and tired, but we were there. Having paid the price, we took a day off and went fishing. I would have liked to have said that it was in proportion to the considerable effort of getting there. It was good. Lots of rainbows rose gladly to attractor dry flies like royal Wulffs or captains, or took soft hackles swung through riffles. Alas none were of the memorable size I had hoped for in a wild unfished river at this relatively low altitude. However the beauty and wildness of the surroundings made an attitude of disappointment hard to sustain. Rumors exist of bigger fish ten miles downstream at Tehipite meadow. The rumors also include tales of dense growth of poison oak populated by rattlesnakes. Taking it easy the next day we moved a few miles upstream to where Cartridge Creek joins the Middle Fork, leaving most of the day to fish. The gradient of the river steepened somewhat here, making lots of deep pools and I caught fish that were a bit bigger. We shared our campsite there with another couple (not fisherfolk) who had come in via the lower canyon. They confirmed the poison oak rumor, but the only rattlesnake they had seen was right near this camp. As of the next morning, the fifth day, we had no more whole days to spare, so we headed up-canyon to the Muir trail at the confluence of Palisade Creek and the Middle Fork, arriving about noon. This was at eight thousand feet. I took a couple of hours and fished, catching numerous regally-colored golden trout. After this rest, we pushed on up Palisade Creek several miles, gaining another thousand feet, stopping just before a steeply pitched set of switchbacks that would lead us up to the Palisade Lakes the next day. We got in some more good fishing for goldens in the creek that evening. 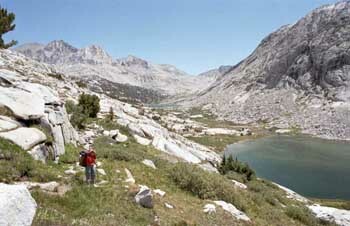 This region of the Sierra is known as the Palisades for the jagged row of peaks that crown the crest of the range here. The next morning we labored our way up the switchbacks and up past the lakes to a camp at eleven thousand feet, positioning ourselves with a about a mile and a thousand feet to gain to reach the first of the high passes, Mather Pass. I spent the rest of the afternoon fishing Upper Palisade Lake, catching goldens. I took a few fish for dinner that night. It's my practice when I take a fish to keep, to kill it immediately, not let it suffer on a stringer. I had been doing this by holding them in one hand and whacking them on the head with my walking stick, at some hazard to my hand and my fly rod held under my arm hopefully out of the way. The classic instrument for doing this is a small club known as a priestundefinedfor administering last ritesundefinednot something I would likely carry on a backpack trip. About the second fish I realized that I had one in my pocket, the priest being a chaplain of the Swiss Armyundefinedwhich is to say a heavy, multilayer Swiss Army knife. It had just the right heft and weight to do the job at a stroke. The seventh morning got us over 12,093-foot Mather Pass to Upper Basin, the headwaters of the South Fork of the Kings River. Now it is possible to follow the river down directly rather than going over the next pass and reach it by its tributary Woods Creek. However the oath I took to myself twenty-six years ago never to do it again was refreshed in my mind, so we didn't consider it. Having finally gotten our high-altitude wind, we breezed down Upper Basin to ten thousand feet and on up to a camp position on Lake Marjorie, a thousand feet below and a mile from the next pass, Pinchot Pass. I fished Marjorie for a few hours catching a few small brookies, confirming the experience others have reported of it. Cresting 12,070-foot Pinchot Pass the next morning, we were reluctant to leave the high country, so we decided to spend the night at Twin Lakes at 10,600 feet, leaving eighteen miles to make in next two days to get back on schedule. It turned out to be a great choice. On the way down we came upon a curious little lake which we were quite sure had no fish in it as it had a thriving population of Mountain Yellow Legged Frogsundefinedtadpoles and adults. These frogs are a matter of some controversy in the region because they cannot coexist with trout in a lake, and they seem to be disappearing as a species. Planting of trout ceased in the National Parks in 1973, and trout have died out in quite a few lakes where reproduction is not possible. This might be thought to provide enough survival opportunity for the frogs. Nevertheless a move is afoot to remove trout by gillnetting some more lakes to expand this opportunity. The conservation-minded fisher will hate to see the fish go, but to oppose it would hardly be consistent with pushing for more water flow for endangered steelhead and salmon in valley rivers. Twin Lakes had a fine population of brookies, which cheerfully took attractor dries presented on the surface. After awhile this palled and I got to recalling a technique I had read in Gary LaFontaine's book "Fishing the Mountain Lakes." One uses a weighted fly and makes multiple roll casts, extending the line and fly out further in the same direction with each cast, out past the shallows to where the lake gets abruptly deeper, going after the fish that hang there. These glacier carved basins are ideal for this tactic. Once it's out, you start stripping it in. The surface disturbance of the roll casts, rather than frightening the deep fish, seems to interest them and bring them up. I got a number of good hookups of bigger brookies this way. As of the next morning, we were eighteen miles from the trailhead which we hoped to cover mostly this day with maybe half a day of walking for the last day. This took us down Woods Creek from 10,600 feet to the so-called Paradise Valley at 6,500 feet where the Creek runs into the South Fork of the Kings. Woods Creek cast many fine fishing opportunities at me on the way down, but lacking time, I couldn't rise to them. I referred to Paradise Valley as "so-called" because it's been turned by Park Service regulation into Wilderness (with a capital W). Because of the heavy usage, camping is limited to designated sites. The usage has made most of the sites about ankle-deep in dust. It's also crawling with black bear--I had to chase one out of my camp. Finally the fishing was lousy--no doubt that the river is pounded hard here, and harvest of pan sized fish has reduced the population to dinks. Perhaps it's best our hike ended this way. Colin Fletcher on completing the first backpack trip the length of the Grand Canyon chose to return to his home in San Francisco via Las Vegas, toward reconstructing his defenses. The next morning we were gladly up early and on our way, and reached the trailhead a bit before noon.